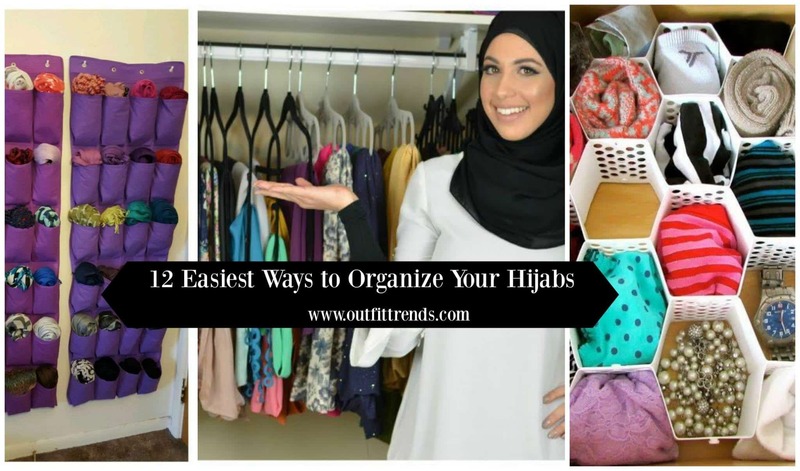 Hijab Organizing Tips . Being a Hijabi or a scarf lover, you might be having an extensive collection of colorful and amazing Hijabs or Scarves. Here, the greatest issue for you would be to have a perfectly organized method of storing your Hijab collection. Putting them in an organized manner and in a small space is a very tedious task indeed! On the other hand, having a large number of Hijabs just dumped into your closet will definitely be a mess for you! and a headache too! to search for a suitable one matching to your dress daily and find the ones wrinkle free too for saving your precious time. We are here with the best ever solutions for your Hijab or scarf storage problems. For help in selecting the right hijabs for this year, you can see these 2017 Hijab Styles. We will share all those brilliant and super easy ideas that will surely help you to keep your hijabs well managed and up to the mark.We are here with the best ever solutions for your Hijab or scarf storage problems. We will share all those brilliant and super easy ideas that will surely help you to keep your hijabs well managed and up to the mark. We are here with the best ever solutions for your Hijab or scarf storage problems. We will share all those brilliant and super easy ideas that will surely help you to keep your hijabs well managed and up to the mark. Organizing your room and your closets will make you feel really comfy and cozy. A well-organized wardrobe will explicitly make the idea of getting dressed up pleasure for you instead of a trouble. A classified Hijab storage idea is easier and quicker way for you to choose the suitable color or design according to your dress as well as it will keep them wrinkle free and neat. 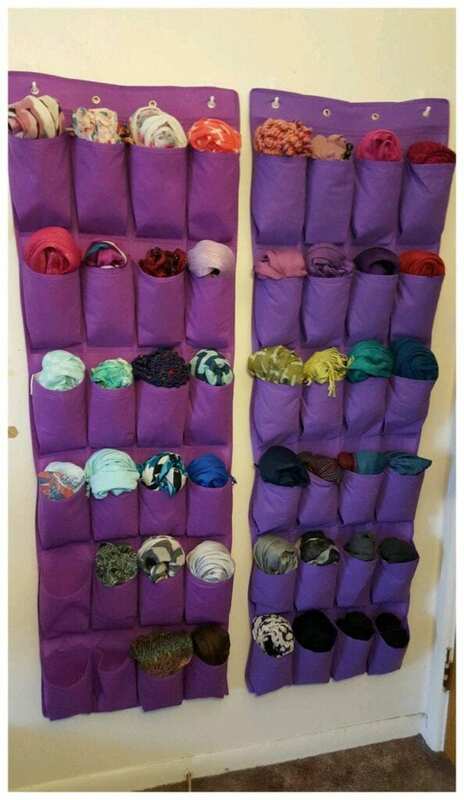 Here you will find these 12 simple hijab organization ideas for daily use really amazing and practical. These wall pocket organizers also one of the diy hijab storage are easily available in the market of organizing and storing small sized equipment and clothes such as socks, ties, wrist watches, and scarves. You can comfortably nail it behind your door or inside your closet. It’s a perfect and quick organizer of your Hijabs. It’s also available in various colors so it will add to the beauty of your room too. If you have less hanging space in your cupboard or closet, these self-designed Hijab boxes are the best option for you. You will not have to spend the amount on buying any piece of furniture or any other organizer for this purpose. All you need is any empty spacious box (you can cover and prepare an empty shoe box too!) and fold all your Hijabs and place them in it neatly and put it anywhere, under your bed or on top of your cupboard. This shoe rack is the perfect solution for organizing your Hijabs behind your door. Here you can classify and display your huge lovely Hijab collection in a beautiful way. The tip for your daily ease is to keep the most favorite ones in the first row and so on. Hijab Hanger Ideas – Be a little creative and make an easy to use Hijab organizer yourself. All you need is to buy a hanger and a pack of shower cap rings from the nearest home store. Place these rings in the hanger and make as many organizers as you need. The best thing about them is that you don’t need to spend time on folding your Hijabs. You can easily place them in and pull the ones you need out without any trouble. This is the best thing for the daily busy routine. You can use your cloth hangers for making a perfect and easy to use Hijab organizer. If you are willing to work on a ‘little Do It Yourself’ technique, this one is easiest for you. Get the shower curtain rings and put them in a regular towel rode. You can fix them in any convenient place and easily arrange all of your Hijabs. If you are color conscience and want to wear perfect matching Hijab daily according to your dress, you have to do a little effort and place all your Hijabs with suitable matching dresses. So that daily you will not have time to waste on deciding what to wear!